CITATION: Burr, Michael, Camilleri, John, Lubkeman, David, Long, Qian, and Du, Yuhua. Microgrid optimized resource dispatch for public-purpose resiliency and sustainability. United States: N. p., 2017. Web. This report, Microgrid Optimized Resource Dispatch for Public-Purpose Resiliency and Sustainability, presents the results of more than two years of research, development, and testing. Project results showed that a multi-zone microgrid control approach – managing distributed solar photovoltaics (PV), energy storage systems, and gas-fired combined heat and power (CHP) units in several independently islanding sub-systems – can effectively ensure the availability of resilient energy supplies in Mid-Atlantic communities. The Microgrid Institute-led project was one of seven that the U.S. Department of Energy’s National Energy Technology Laboratory (DOE NETL) selected for funding in its competitive 2014 R&D funding program, “Microgrid Research, Development, and System Design” (FOA 0000997). 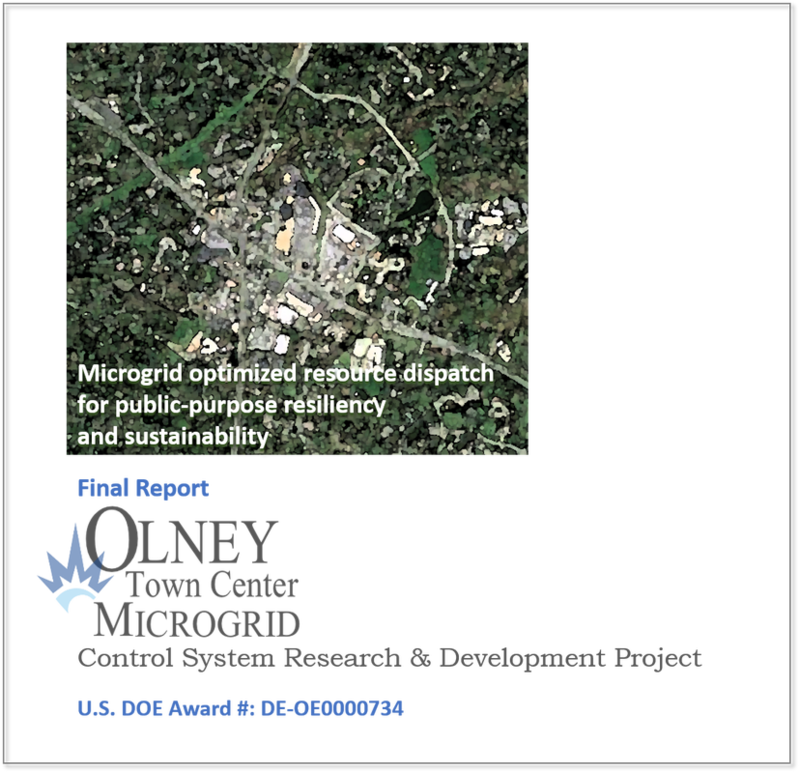 The Olney Town Center project focused on research, design, development, and testing (in simulation) microgrid systems for Maryland communities, with Olney Town Center selected as the primary design-test area. In addition to technical factors, the project also examined regulatory and planning issues affecting potential for utility rate-base investments in Maryland public-purpose microgrids. ​This report is catalogued by the U.S. Department of Energy's Office of Science and Technical Information (OSTI).